Rosa Parks went to Industrial School for girls. She took academic and vocational courses. She later went to a Laboratory School for secondary education but dropped out so that she could care for her grandmother and mother. 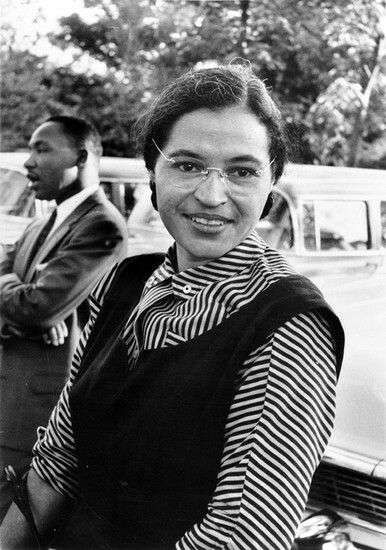 Rosa Parks was Determined, Brave, Courage, Inspiring, Full of Pride, and Intelligent. Rosa Parks was of African Ancestry. She suffered from poor health with chronic tonsillitis and grew up on a farm after her parents had separated. She was interested in sewing, cooking, cleaning. Although she was a leader she did experience setbacks. Some of her setbacks were being jailed after refusing to give up her seat too a white passenger, and she lost her job. One day after work Rosa refused to give up her seat in the colored section to a white passenger. In these days it was the law to give up your seat to a white passenger. Parks was arrested for this act of defiance and it soon became known as the "Montgomery Bus Boycott" . This act became a important symbol of the modern Civil Rights Movement.